To a small saucepan, add the milk, cinnamon stick, star anise, pinch of salt and sweetened condensed milk. Stir until combined. Bring the milk mixture to a very warm temperature. Immediately turn the heat off and cover. Allow to steep for 10 minutes. Meanwhile, melt the chocolate in a double-boiler or in the microwave. Remove the star anise and cinnamon stick from the milk mixture and pour in the chocolate. Turn the flame to medium-low and whisk in the melted chocolate until combined. 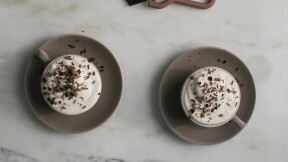 Pour into mugs and top with whipped cream and chocolate shavings.